Looking for roadhouse rockin' blues that bites like a shark and kicks like a mull? Then Gone Crazy will make you delirious with 45 crazed minutes throughout 10 tracks. In addition to delivering coarse vocals and muscle-bound lead guitar, Stulo contributes with 9 original scufflin' songs laced with invigorating rhythm. Many years ago Muddy Waters proclaimed "the blues had a baby and they named it rock and roll". This disc is exactly what Waters was referring to. "Strange Things Happening" shuffles with the meaty rhythm section of Jim Denk (bass) and Craig Panosh (drums). Each artist pounds their respective instrument with a skillful attack. At times, Jay makes his voice shriek like his bottleneck guitar. A rock solid guitar solo expresses the calamity of "My Other Woman Has Another Man". The title track is a Texas boogie with barrelhouse piano courtesy of Mike Vlahakis. On "Let The Devil Drive", Jay and Jimmy Crimmins alternate lead guitar solos. Here, Crimmins plays with a softer tone and higher pitch while Jay's vocal harmonies with Rod Zimmerman are supreme. Hot chord combinations and excellent guitar tone enables "I Don't Think You Love Me" to stand out. It trims the band back to a basic power trio and they rip. The final number is the disc's surprise track. On it, Jay exposes his soft side which contrasts with his image of a hard-edged, tattooed, blues-rocker. The song is a beautiful ballad made even more reverent by Mike's piano and Jay's expressive vocals. Born in Milwaukee into a musical family, Jay Stulo was encouraged to play at an early age. After moving to Eau Claire, Jay met James Solberg and began playing guitar with many regional and national blues acts. In particular, Luther Allison became impressed with Jay and it wasn't long before Jay hit the road as Luther's guitar tech and apprentice. Eventually, in 1995, Luther encouraged the budding musician to start his own group. Allison's influence shines through on in-your-face tracks like "Your Gonna Miss Me". There are no gimmicks found on this disc. It is an accurate and simple recording of what this heavy duty band sounds like. Unfortunately no information about Stulo or his band members are provided and the cover's low resolution photo indicates a tight budget. Sure there are many bands out there doing similar music. 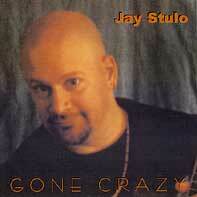 If you enjoy the heavy hitting style, Jay Stulo excels at it. This review is copyright © 2002 by Tim Holek, and Blues On Stage at: www.mnblues.com, all rights reserved. Copy, duplication or download prohibited without written permission.